Azzaro pour homme, Summer Edition 2014. The scent of color. When summer heats the streets, freshness is a matter of wellbeing. Every year, fragrance brands launches several “summer” variations of their iconic fragrances. Rather than giving you a full review, I wanted to share my best for this summer. It is Azzaro Limited Edition summer 2014. When elegance, rythmn and charisma color up your day. Azzaro pour homme is the classic fragrance for men. It became the ultimate icon of masculine elegance. When the original fragrance was launched at the end of the 70’s, Loris Azzaro knew he had invented a new contemporary classic. It was the base of modern masculinity and became the invisible mark of many men. The iconic brand developed through the years an amazing territory for masculinity and elegance. Today, more than 30 years after the launch of the first fragrance, the charismatic universe of Azzaro is completely aligned with today’s men. This summer, the brand proves it once again by bringing a stylish contemporary vision of the Azzaro man, always ready for a new adventure. Started last year, this is a series of refreshed Azzaro pour homme. You will find all that an elegant man would need to spend a summer in style. This year, Azzaro, truthful to its latin origins, makes you escape towards more exotic lands. The masculine brand draws its inspiration from Latin America. No precise destination, it is more the imaginary ambiance of being in a place where the sun caress your skin as a new adventure ready to start. The Flacon is the iconic Azzaro Flacon, geometric, masculine, modern and shaped for a man’s hand. Its design gives the perfect hint of elegance for the modern gentleman. For this limited edition, the French artist Emeric Trahand, as known as Takeshi, created this original drawing inspired from the concept and the olfactory creation. Takeshi is well known for his surrealism style and the fact that he blends several techniques, from illustration to photographic redemption. He is a true poet with colors and masters perfectly the translation of emotions into images. In terms of olfactory structure, the new creation is a translation of Azzaro pour homme into a summer theme. The aromatic fougère structure of Azzaro is enlighten with crispy Star Anis, fennel and basil accord to start. It gives a dazzling hook to the fragrance, away from the traditional citrus structure that we find usually in this summer theme. That’s why it makes it more original. The heart of the fragrance contrasts between the brightness of Cardamom with a textured Patchouli, Sandalwood and Vetiver trio. Masculinity at its best. The fragrance ends with a modernization of Amber, oak moss, musk and a hint of leather. It is all in contrasts. The perfumer needed to master all these elements in order to bring a contrasted freshness, both bright and elegant. The perfect match for the modern dandy. For a day of work or for a casual weekend, it will be your beautiful companion for this summer. For more information you can visit the brand official website: http://www.azzaroparis.com. Summer is not necessary a season with less interesting fragrances. At the contrary. It is a season of freedom, with less pressure for creation, and fantasy can deliver the best. It is normal, it is summer. Info sourced at Azzaro communication release. The product tested was a courtesy of Azzaro Paris. All content is copyrighted with no reproduction rights available. 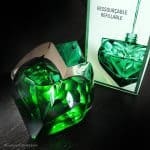 ﻿Why Aura Mugler is a great Mugler?